Traditional fax machines are an outdated technology, but faxing is still needed quite often in business. Get easy faxing anywhere with an eFax free trial. This page lists the latest eFax.com free trial offers, discount promotion codes, and special deals. Whenever possible, we geeks like to accomplish our tasks electronically. Fortunately for us, eFax is transforming the way we send documents. At www.eFax.com, you can get a new fax number in less than two minutes or bring an existing fax number over to eFax. Both individuals and small businesses can secure complete internet faxing plans with the world’s number one online fax service. Purchase a monthly or annual plan that gives you scores of fax pages a month and longtime storage. At eFax.com, you’ll discover a simple online faxing tool that makes it possible for someone to send a fax to your eFax number so you can receive the document as an e-mail attachment. No more running to the fax machine to await its slow receipt and printing of a fax; just download your attachment and print it whenever you want, or simply read it on the computer. With eFax, there’s no more missing important faxes because you don’t happen to be in the office. Find specific faxes quickly with the eFax searchable fax feature. Perhaps most importantly, eFax allows you to send and receive faxes from anywhere you have a computer; there’s no need to locate a fax machine. You’ll not only save time, but you’ll also save money by eliminating the costs of a fax machine, fax line, and fax supplies. The eFax service is the preferred online fax provider for over 11 million people worldwide with a vast selection of local and toll-free fax numbers. 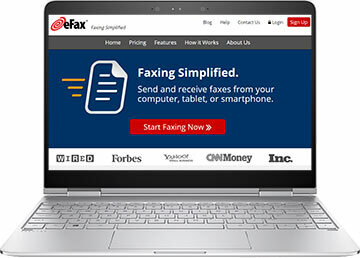 Quickly and conveniently access faxes from your laptop, desktop, or wireless device. Take advantage of eFax’s global, technologically advanced servers with a 99.5% uptime. Avoid busy signals and store faxed documents for up to two years. Owned and operated by industry leader j2Global Communications, eFax is an ideal solution for the faxing needs of individuals and businesses.